Well, if you're a regular reading of my site, you probably read a number of other comics-related sites and I don't need to tell you that the offices of Charlie Hedbo, the French satirical newspaper, were attacked by two gunmen yesterday. Twelve people were killed and eleven wounded. From what I'm picking up, that's essentially the entire staff. Check your favorite news source of choice for more up-to-date details. Needless to say, this is absolutely horrible. There is no justification for murdering people who wrote/drew things you didn't like. I hope the gunmen are brought to justice (not vengeance, mind you, justice) and the families of the victims are able to come to terms with what's happened, emotionally, financially and physically. 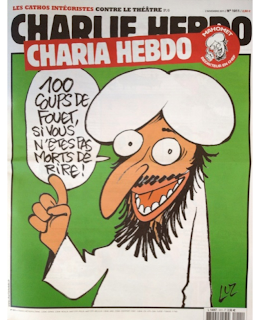 I vaguely recall hearing about the Charlie Hedbo offices being fire-bombed a few years back for publishing a cartoon of the Prophet Muhammad on their cover; depictions of Muhammad are expressly forbidden in some Islamic sects. But by and large, Charlie Hedbo was almost entirely unknown to me prior to yesterday. So I spent a good chunk of the evening playing a bit of catch-up. The immediate reaction of many cartoonists was that this was a terrorist act to try to silence freedom of the press, and Charlie Hedbo cartoons should be circulated even more widely in retaliation. But I also heard a number of people pipe up to say, "Yeah, killing those cartoonists was terrible and wrong, but their cartoons were racist, homophobic and mysoginistic." Usually a comment along those lines is then followed with several examples, which only helps me a little since I don't read French and have zero notion of context. Even with a Google-supplied translation, I can't tell if the cartoons are referring to specific events or people, or they're addressing something more broadly. Are the jokes simply that they're depicting Muhammad in ways that he wouldn't actually behave, or is there some social statement being made in reference to perhaps a new law that had been enacted? There's an even broader issue that I haven't been able to figure out for years. Is it racist to depict a Muslim as they are often caricatured? I haven't been able to figure this out because people seem to argue that point, but from everything I've read, Islam is a religion, not a race. Which means it's a belief system that you elect into. Same with Judaism. They can of course be part of someone's identity, but people can choose how much they want to participate in that religion, if at all. Comic book creators Françoise Mouly and Michael Netzer weren't born into Jewish families; they converted to that religion as adults. Writer of the popular Ms. Marvel title, G. Willow Wilson didn't convert to Islam until she was in college. That's not to say people can't be persecuted or discriminated against because of their religion -- both history and current news are rife with examples of exactly that -- but I have trouble seeing it in the same light as persecuting or discriminating based on something that an individual has no control over: gender, sexuality, race, country of origin, etc. I don't want to sound callous here, but I simply don't understand conflating them. You can choose your religion, you can't choose your race. I would sincerely appreciate someone explaining how/why religion so often gets equated with gender, race, sexuality, etc. I saw someone bring up the notion that most of us are looking at these Charlie Hedbo cartoons through the lens of our own cultural backgrounds. That some of what we're seeing is simply endemic to French cartooning -- large-nosed characters for example -- and seeing it in a few isolated cartoons provides a skewed perspective. They're not shows Jews and Muslims with big noses; they and the rest of French cartoonists show EVERYONE with big noses. That's just a cultural norm. But the other aspect to that, too, is that there are cultural norms in France that are more socially acceptable than those here in the United States. That whatever racism, misogyny, etc. we see in Charlie Hedbo is simply a reflection of French society as a whole. Skewed a bit to the liberal side, perhaps, but a reflection nonetheless. It might be akin to looking through US comics from the early 20th century and seeing how African-Americans were depicted. It wasn't viewed as racist within the culture at the time; that was just the standard cartooning convention. That doesn't make it right, of course, but it's a way of stating that maybe what we see in Hedbo is more indicative of broader cultural issues in French society than it is of any of the individual cartoonists. No one should ever get shot, much less killed, for drawing a cartoon, even if it is deliberately and very consciously offensive. Everbody has the right to speak their mind. And there is absolutely a place for other people to criticize whatever cartoons they care to. But criticism is not made with bullets and fire-bombs.